Wedding soup or Italian wedding soup is an Italian soup consisting of green vegetables and meat. It is popular in the United States, where it is a staple in many Italian restaurants. Wedding soup consists of green vegetables (usually endive and escarole or cabbage, lettuce, kale, and/or spinach) and meat (usually meatballs and/or sausage, the latter sometimes made of chicken and containing Italian parsley and parmesan cheese) in a clear chicken-based broth. Wedding soup sometimes contains pasta (usually cavatelli, fusilli, acini di pepe, pastina, orzo, etc. ), lentils, carrots, or grated parmesan cheese. 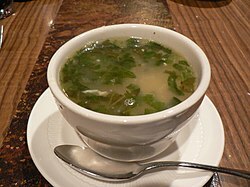 The term "wedding soup" comes from the Italian language phrase "minestra maritata" ("married soup"), which is a reference to the flavor produced by the combination/"marriage" of greens and the meat. The minestra maritata recipe is also prepared by the families of Lazio and Campania. Some form of minestra maritata was long popular in Toledo, Spain, before pasta became an affordable commodity to most Spaniards. The modern wedding soup is quite a bit lighter than the old Spanish form, which contained more meats than just the meatballs of modern Italian-American versions. ^ Jones, Diana Nelson (July 22, 2004). "Food historian shows how immigrant recipes have survived, and served, America". Pittsburgh Post-Gazette. Retrieved 17 November 2012. ^ "Italian Wedding Soup Origins". Snopes.com. 2013-04-16. Retrieved 2018-02-05.